Can you get from here . . to there without getting lost or stuck or having to backtrack? 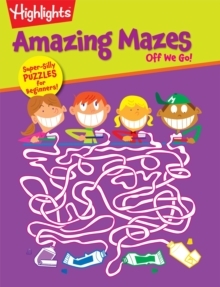 Nobody knows mazes better than Highlights--for more than 65 years, our puzzle experts have challenged and delighted maze fans with tricky twists, intricate turns, and zany zigzags. Now it's your turn to try with our Amazing Mazes series. Whether you're a beginner or an expert, these books offer hours of pathfinding fun.